RETIRE IN STYLE BLOG: 5 Great ways to ensure debt free retirement…..
5 Great ways to ensure debt free retirement…..
2008 will cement its place in history as the birth of a global financial crisis as the rise in consumer living costs stirred with heavy cuts in employment and income reductions for the average hardworking family. The traditional model of family finance peaks at retirement when there is the beautiful moment of the release from work and life’s pressures, providing a harmonious time to enjoy the easy life with your pool of sustainable assets and trust fund savings. Although this has been the real dream for many, the level of family debt has risen steadily over the past decade leading to deeper questions surrounding financial management and living within your means. Many have now retired with debts that have blunted the thrill of retirement, whilst in contrast; good financial planning will invaluably aid your goal to retire debt free. Here are five methods to consider within contemporary financial management. 1. Preparation andContingency Planning. Living within the means of your income should include providing 10% of shared gross income into a contingency fund; this can then be used for the unexpected scenarios of divorce, illness or business failure. If a tough situation like this arises then acquiring swift finance is both challenging and costly in the longer term. This contingency fund further provides you with a useful savings trust if it is not required in your hour of need. Tax Efficiency and Re-balancing debts. The levels of debt can be reduced by meticulous planning and monitoring of tax payments to ensure only obligatory payments are made on your income and assets. Business debt and rental property for those on the higher tax bracket can be removed from taxable income and should be a slimmer priority for those in the higher tax bracket. Constructing a Budget. The budget construction should be methodically planned on an annual basis considering all incoming and outgoings and representing the disposable income available on all monetary investments. A budget plan can also shine a light on your largest outgoings and identify where changes in cash flow could be made. Tracking your spending can also be highly valuable when identifying the cash flow changes over a significant period of time. Prioritizing Debt and Earning. 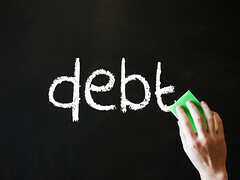 All debt is bad debt, but categorizing the importance of each debt based on interest is one way to prioritize payments. Paying of the smallest bills first can allow you to avoid future interest, and is a useful debt reduction strategy as you will also accomplish removing a bill from the list of outgoings. Prioritize Importance and Monetary Philosophy. Capital investment after covering the necessary areas of education, food and maintenance should consider a philosophical approach to spending. Whilst there is the pressing urge to acquire that new wide screen TV, a weekend away with your partner could become a far more valuable investment for the relationship strength it provides and an ability to make tough decisions as a team. Author Bio – James Barnett is a writer on behalf of Cooper Matthews analysing contemporary wealth management for families across the UK. This is a sponsored informational post. Funny you should write about this. I've recently been sorting out our finances too. Good tips.